New Primary Inspection Kiosks are now available at Montreal-Trudeau airport for border control. 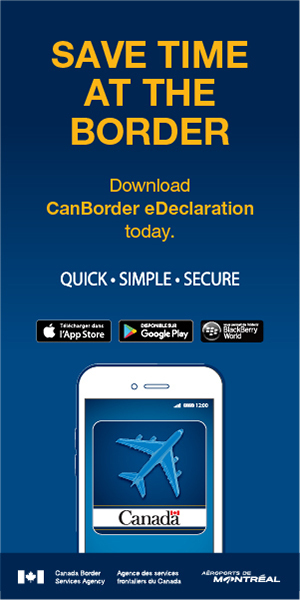 To save time on your return, download the CanBorder - eDeclaration mobile app. This application reduces the processing time at the terminals by 50%. To learn more, visit www.cbsa.gc.ca. You can reserve your parking space online directly. In addition to speeding things up, you could also save money! Put all liquids, aerosols and gels in containers of 100 ml or less together in a large transparent plastic bag. Do the same for medicines, infant formula and breast milk, and make sure they’re properly labelled (with the name of the manufacturer and medicine). Gifts should go in your checked luggage! If you’re travelling only with carry-on luggage, make sure the gifts are not wrapped. You are strongly urged to check the complete list of items allowed or prohibited by CATSA. Keep this link handy! Are you travelling in a group or with young children, elderly and/or disabled people? We can help make your time with us simpler and more pleasant. By going to this section of our site, you can discover our various services and facilities, such as our security line reserved for people with limited mobility, our TTY telephones for the hearing impaired and our courtesy carts service available to all passengers. Most airlines operating at Montréal–Trudeau let you check in online up to 24 hours in advance. You’ll instantly receive by text message (SMS) the current status of your flight or an alert for any schedule change of more than 10 minutes. Before leaving home, make sure you have all your travel documents handy: airline tickets, valid passport, visa, etc. To avoid setting off the alarm at the walk-through metal detector, avoid wearing belts with big buckles, large items of jewelry, clothing with metal buttons, etc. We also recommend that you wear easy-to-remove shoes, just in case. Since you have to arrive at least three hours in advance, it’s essential to plan the best way to get to the airport. Check the Access section to find out about the various options: the 747 shuttle, taxis, limousines, Uber or Car2Go. If you’re coming by car, remember to check roadwork information. Check your flight schedule online or by contacting your airline. These are another good way to avoid lineups at traditional check-in counters. Note that luggage must be dropped off before you go through security. Once you’ve completed your check-in and dropped off your luggage, go through the security checkpoint. In your hand: your boarding pass and passport. In your carry-on luggage: coins, keys and small metal items. In the bins: your winter coat or jacket. Removed from their cases: your laptop, video camera and film camera. Check that all your electronic devices are charged and can be switched on. Note: Electronic devices that cannot be removed from their cases or switched on during the security check will not be allowed beyond the checkpoint. Since March 15, 2016, visa-exempt foreign nationals who fly to or transit through Canada need an Electronic Travel Authorization (eTA). Exceptions include U.S. citizens and travellers with a valid visa. Apply now for an eTA ! Download the eDeclaration mobile app for free onto your smartphone or tablet. Create and save your traveller profiles. Select "My Declaration" and answer the questions to create your quick response (QR) code. Scan your QR code at a Primary Inspection Kiosk. Scan your travel document, take your photo and confirm your declaration on-screen. Take your kiosk receipt to a border services officer. Note that your checked luggage is collected after the border control. For more information, visit the Canada Border Services Agency website. If someone is coming to pick you up, ask your greeter to use the CellParc waiting lot. If you’re ordering transportation, wait until you’ve collected your luggage and are in a public area.